It's all up to Trump, who may tweet anything at any time about China, the Shutdown, OPEC, Comey… There's no way to tell what the President will do because what he does seems totally random and 80% of what he says is a lie and the other 20% are pronouns – so you can't go by what he says or what he does and you can only react to what he tweets – that's crazy! 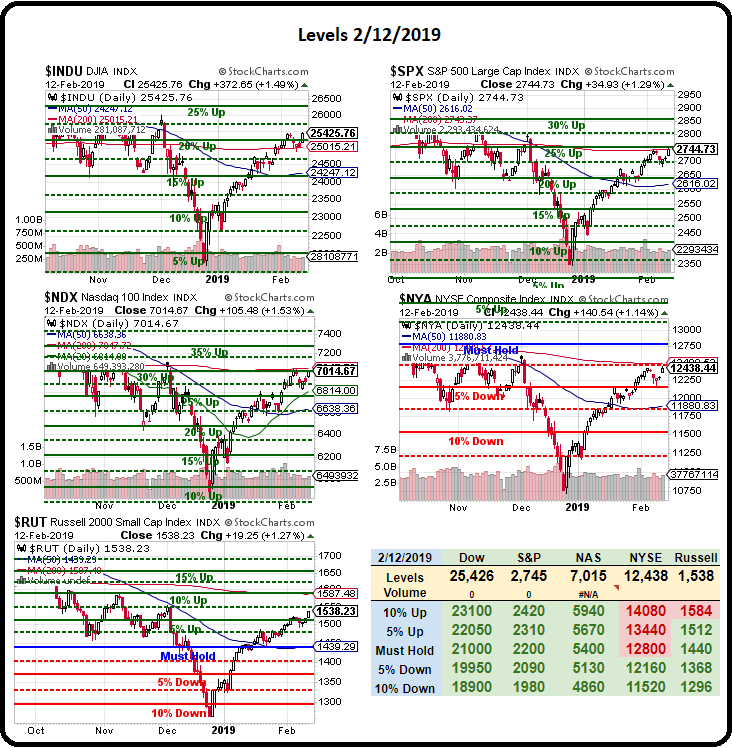 The markets rocketed higher yesteday as we finally broke through our 200-day moving averages, which are currently Dow 25,015 (now 25,502), S&P 2,743 (now 2,752), Nasdaq 100 7,047 (now 7,050), NYSE 12,500 (now 12,500) and Russell 1,587 (now 1,543) so we need confirmation from the Nasdaq and the NYSE today and, of course, the Russell has some work to do to catch up. Yesterday we had Congress telling us they had a funding deal and Trump saying he might approve it – even though it only gives him enough money to build a picket fence – as long as he paints it himself. We also had all the people on the US side saying China Trade Talks were going great but then Trump said he's not planning on meeting with Xi in March – so how great can it really be if the March deadline is on the 10th? Trump also said he might extend the deadline – again, who knows?